Recently, I was looking for a text editor that is capable to open and edit an SQL dump as large as 2.7 GB, and I only found EmEditor to be the workable one. Most of the well-known text editors for Windows failed to open the file. Several managed to open, but became extremely slow and easy to crash during navigation or editing. EmEditor by Emurasoft has been around since 1997. Its user interface is still Windows 95 alike, and not that impressive at all. It seems to be powerful, with quite a lot of functions, but looking for the function will probably need some times searching in its menu items. It has most of the basic function of a modern text editor, including syntax highlighting for programming languages and scripts. ability to open and edit large text file, as big as 248 GB or 2.1 billion lines! 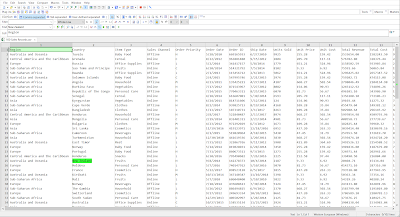 ability to manipulate CSV file with nice tabulation of the data into columns. 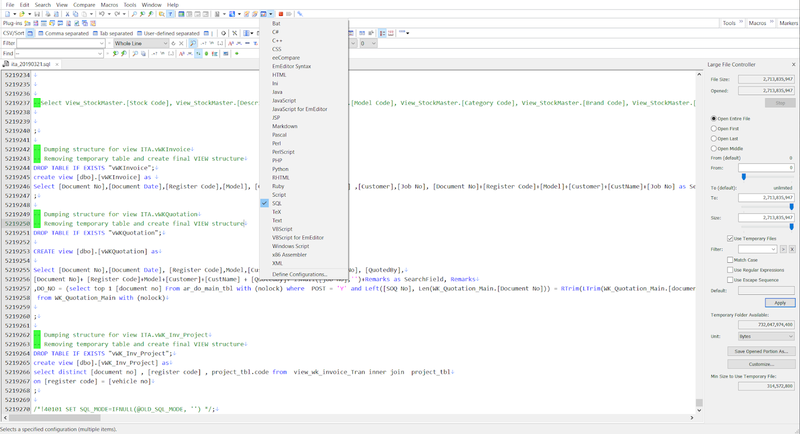 If you need a lightweight editor to open text file with millions of line, you are very likely end up with EmEditor. EmEditor is able to open such large file without consuming much memory or taking up much CPU resources. EmEditor is pretty fast in loading the large text file. If the file is really large and over a gigabit, it still needs some times to fully load the file, but not that long. Sequential moving in between text is seamless and fast, but jumping will take a longer time. Editing character by character is also fast, but text replacement with highlighting and cut will also take a longer time. EmEditor has function to split a file into multiple smaller files, and also the reverse function to combine several files into one. This is handy in the situation whereby you need to search for a portion of the large file, and export it out for further manipulation using other tools. Another situation is to split a large chunk of SQL dump into smaller files, so that the SQL server can import by handling smaller files. EmEditor has powerful CSV manipulation functions similar to spreadsheet such as MS Excel or LibreOffice Calc. 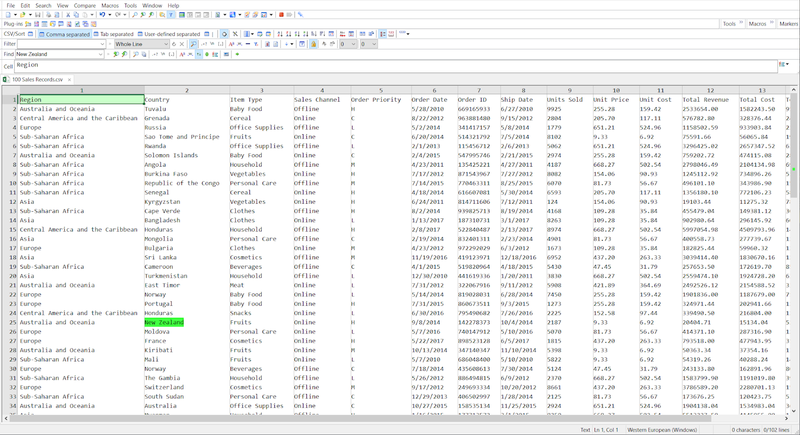 Compared with those spreadsheet programs, EmEditor is pretty lightweight and faster to load up. It can tabulate the CSV data into columns, insert/delete a column, perform sorting, perform filtering, convert the CSV separator, etc. Because of these 2 unique functions, I find EmEditor a handy tools for IT person, particularly for dealing with large text files involving dataset or log file.